According to the NDHS 2013, 4.6% of girls in Kaduna State have experienced sexual violence; the highest in the north western region. Despite the efforts made by the Kaduna State Government to put in place a Sexual and Gender-Based Violence (SGBV) response system, one out of every three girl did not report their experiences or seek help. Based on this finding, EVA launched in two communities – Kakuri and Tudun Wada in Kaduna North and South, respectively the project, “Advancing the Rights of Adolescent Girls and Young Women”, a Direct Aid Program (DAP) funded by the Australian Government and managed through the Department of Foreign Affairs & Trade (DFAT) overseas posts. This initiative is developed to uphold the rights of young women and girls to be free from sexual and gender-based violence. Being implemented at community and state level, the project challenges harmful social norms held by community actors, strengthens the agency and social capital of adolescent girls and young women, with emphasis on girls with disabilities and girls affected by the AIDS epidemic through safe spaces, and improves state level SGBV reporting and response systems. This new initiative builds on EVA’s work in Kaduna state on the Violence against Women and Girls Observatory, funded by Nigeria Stability and Reconciliation Programme (NSRP). The Observatory is a safe space for documentation, tracking and response to violence against women and girls. 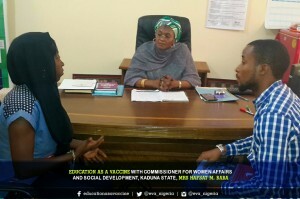 As part of the setting off activities, EVA held introductory meetings with the Ministry of Women Affairs (MOWA), conducted community engagement activities and assessed Kaduna’s first Sexual Assault and Referral Centre (SARC). A formal meeting was held with the Commissioner for Women Affairs and Social Development to introduce the project. The team shared that this initiative will build on EVA’s exis ting work with the Observatory. 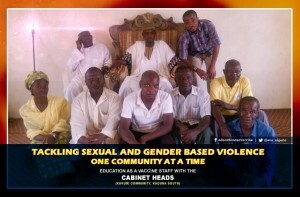 However, it will bring in the dimension of community level interventions to address some of the root causes of sexual and gender based violence and also increase the number of reports received on the Observatory. It will also work with the Ministry to improve its response to cases of sexual and gender by strengthening the medical and psychosocial support provided to survivors. The Commissioner responded by congratulating EVA on the launch of the project in the communities. “The Ministry will help in sustaining the project after 18 months when EVA would have rounded off the project”. In preparation for community level interventions that would help change negative social norms that increased girls and young women’s risk to sexual and gender based violence, familiarization meetings were held with key decision makers in Kakuri and Tudun Wada communities. The project team met with the District Heads of Kakuri and Tudun Wada communities as well as 11 influential members of both communities. “This is a welcome development. We have been having series of domestic and sexual violence cases, and sometimes, it is usually overwhelming and beyond us. Your project will help stop or reduce this violence”- Bala Yerima, Seriki Kakuri District Head. The advocacy visit also gave EVA the opportunity to gain entry into the communities in order to conduct a baseline survey to understand the views and opinions of the communities’ members on sexual and gender-based violence and use the results to streamline project implementation. The Sexual Assault and Referral Centre (SARC) was assessed to provide evidence to support further strengthening of delivery of GBV services within the state. To achieve this, interviews were conducted with representatives of the Kaduna State Ministry of Women Affairs and staff posted to the SARC in Tudun Wada community. Although this facility is in place, there is no public awareness campaign plan in place for the centre as people get to know about the facility through word of mouth communication. Based on these findings, EVA has developed a capacity strengthening plan for the SARC to ensure access to quality and cost effective GBV services. Moving forward, EVA will train volunteers to conduct safe space sessions with adolescent girls and young women giving them an opportunity to engage with each other, exchange information, and rebuild community networks and support. In the same vein, adolescent boys and men will be engaged to challenge negative norms that support violence and a culture of impunity championing the fight against SGBV to more communities.